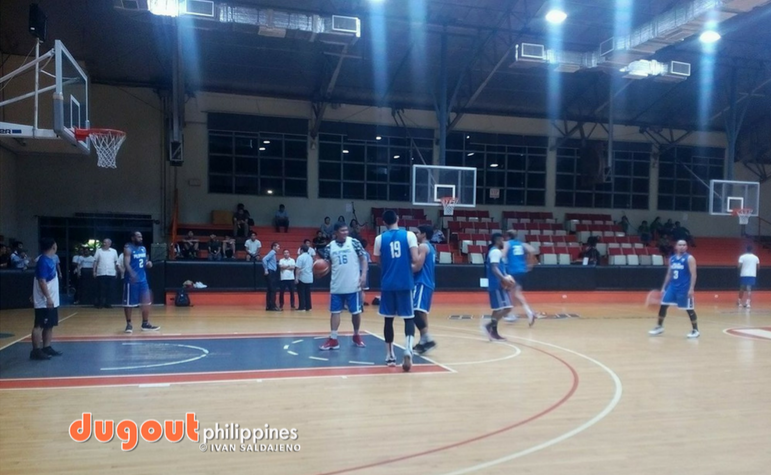 PASIG--All but one player came as Gilas Pilipinas' daily grind for the Asian Games officially began on Monday night at the Meralco Gym. The Rain Or Shine core, that is, the group of Maverick Ahanmisi, Raymond Almazan, Beau Belga, Gabe Norwood, Chris Tiu, and James Yap, is in complete attendance. Also participating in the practice were Asi Taulava, Don Trollano, Paul Lee, Stanley Pringle, Ricci Rivero, and Kobe Paras. Poy Erram also showed up but was relegated to an observer. Only Chris Standhardinger, who on Sunday night played in Game 5 of the PBA Commissioner's Cup Finals for San Miguel, was not in attendance. A surprise addition to the players present in practice was Gilas cadet Abu Tratter, but according to Coach Yeng Guiao, he was in practice to cope up for the absence of Standhardinger and the recovery of Erram's back from an injury.